Saint Lucia: the island my puppy Lucy was named after. Located in the southernmost part of the Caribbean, the island sits just north of Venezuela and lies between St. Vincent and Martinique - both visible from Saint Lucia on a clear day. Unlike the extremely touristy cruise ship port of Castries in the Northwest, Soufrière is an ideal destination for excursions in the morning, R&R in the afternoon, and a taste of local flavors in the evening. A small seaside town humbly situated beneath the magnificence of the Gros and Petit Pitons, Soufrière offers the picture perfect landscape I once thought only existed on television. It has the most dense and flourishing hillsides I have ever seen (more than Hawaii, Mexico and Costa Rica combined). The streets are bustling with children and the church bells ring in harmony with the waves lapping upon the shore. The days have a way of lasting, but the week I spent there flew by. Fortunately, I checked off all my to-do's. Best beach on the island? Anse Chastanet! 1. 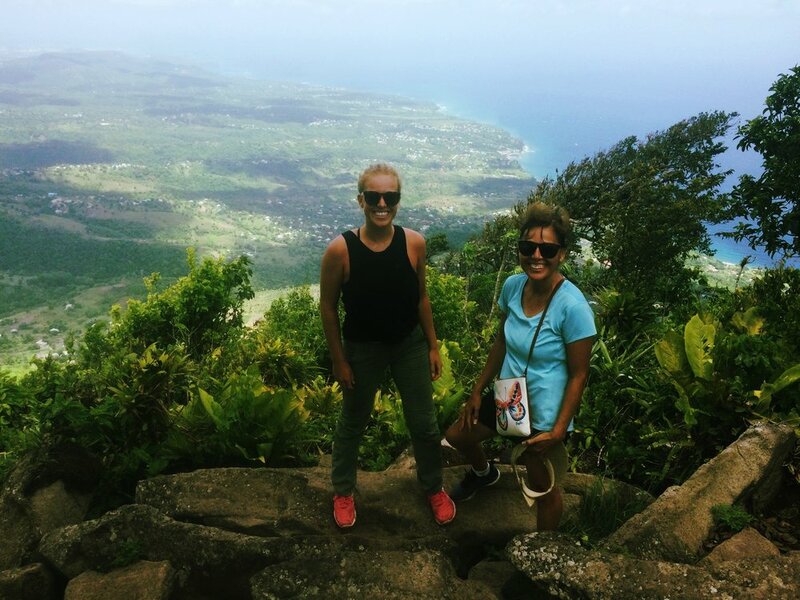 Hike the Gros Piton: As a result of my Travel Channel obsession as a kid, this had been on my bucket list for a good 10 years. So upon arrival I told my mom that, more than anything else, I needed to summit that peak. She laughed at the magnitude of the task at hand. But 24 hours later, she was standing (out of breath & knees shaking) at the top - I have never been so proud. 2,700 feet above sea level and 4 hours round-trip, it's required that you take a guide with you. And even if you think you don't want one, TRUST ME, I am anti-guided tours and I was so grateful to have him with us. When you arrive at the foothill, you can pay $30/person to climb to the top with a guide. A walking stick is not necessary but available for another $5 (my mom was glad to have one). Food and drink not provided - bring your own! And bug spray, sunscreen & a hat. Wear pants and shoes with a good grip on the bottom (it's a rocky journey to the top). Also, I recommend starting your journey as early as possible to avoid high-noon heat and afternoon showers which can make the path very slippery. P.S. This is one of the best things I've ever done. We had a blast and soooo many memories were made in just 4 short hours. 2. Hotel Chocolat: Willy Wonka's Caribbean hideaway - where everything from the butter to the cocktails, even the spa treatment, was decadent. 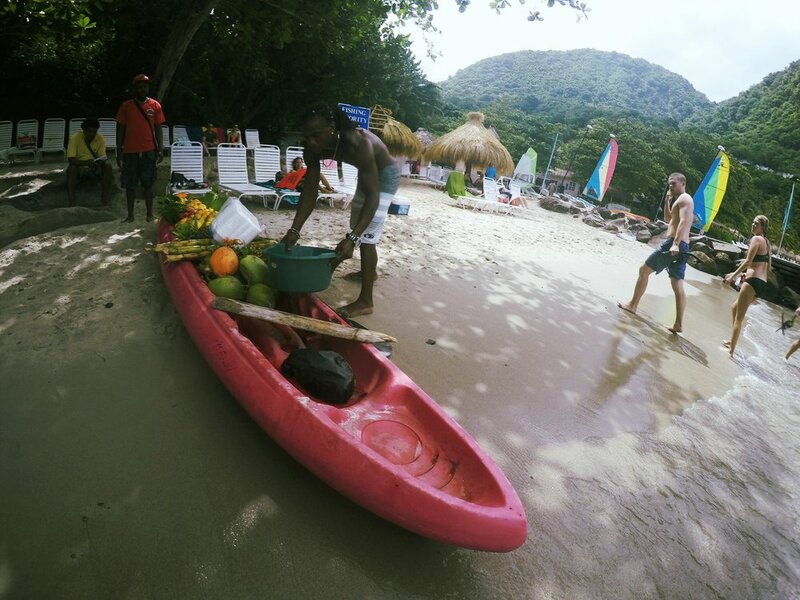 We started our day at the beach and spent the afternoon getting chocolate massages, lounging by the pool and treating ourselves to some well-earned calories after our recent trek up the Gros Piton. Much needed R&R in the most idylic of places. This is a CAN'T-MISS when traveling to St. Lucia. 3. The Mango Tree: Yet another eatery that made this trip so wonderful. My mom & I were full after sharing a few tapas and only paid like $35 for the whole meal, including a couple glasses of wine. The food was fantastic and surprisingly very affordable, but it's the view of the Pitons that made it so special. Situated poolside with a live steel drums band by the bar, The Mango Tree overlooks the Caribbean and is so close to the Petit Piton you could practically reach out and touch it. The staff was also absolutely phenomenal - kind, warm, helpful and happy. 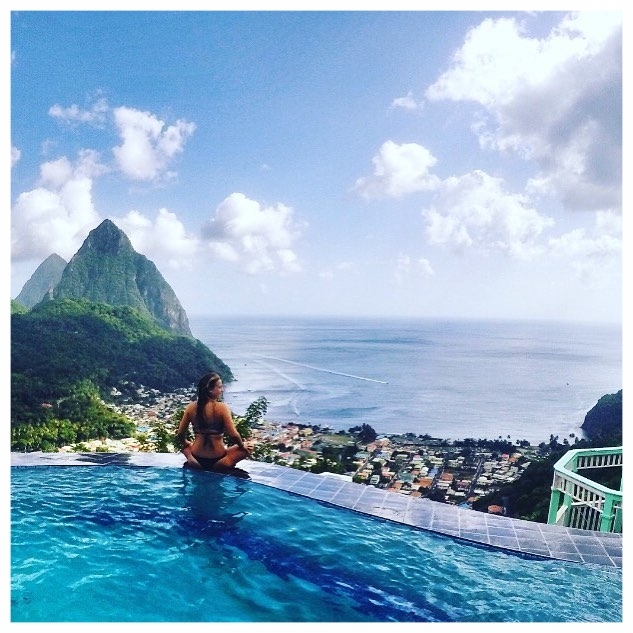 Truly the perfect St. Lucia experience. 4. La Haut Resort: In addition to the fact that it's pronounced "La Ho," there are many other reasons to love this Bed & Breakfast. Well first, the bed part is lovely. Super comfortable room with a million dollar view. Air conditioning, hot water, mosquito nets (even though I didn't have any problem with mosquitos there). And the breakfast was also super good! All fresh, local, & homemade, served every morning on the patio, overlooking the Pitons. There are 2 pools, one near the restaurant and the other is an infinity pool at the opposite end of the plantation overlooking the ocean. The staff here was wonderful - so sweet and smiley and genuine. They will even drive you down to the beach and pick you up for FREE! 5. Private Snorkel Tour: We went through a guy better known as "Simon Says." We started our day @ Soufrière Bay and from there set off toward our first of three snorkel destinations. Right under The Mango Tree restaurant was a deserted beach with some of the best marine life I've ever seen. Second were the pristine shores of Sugar Beach between the two Pitons. And last was a quick boat ride north of town to open waters and a spectacular view of the island's landscape. Snorkeling took approximately 2.5 hours followed by lunch at Simon's family owned restaurant in the heart of town where we sampled Roti, a local favorite. Imagine a Caribbean inspired burrito with Indian flavors and Latin spice. Although not my favorite food in the world it was pretty good, especially after a few hours of swimming, and the restaurant itself was swarming with locals, making for a unique cultural experience. And if you don't go with a lover, be prepared to explain your singleness to all the honeymooners wearing his & her t-shirts at the airport. As always, wishing you safe travels! Mar 22 Costa Rica: It comes with the territory.